After all of my twentieth anniversary surprises were revealed, I realized we were having a Bill and Giuliana Rancic kind of weekend. Which was actually kind of fun, since I really enjoy their show on the Style Network. Do you remember “The Apprentice” before it was “Celebrity Apprentice”? 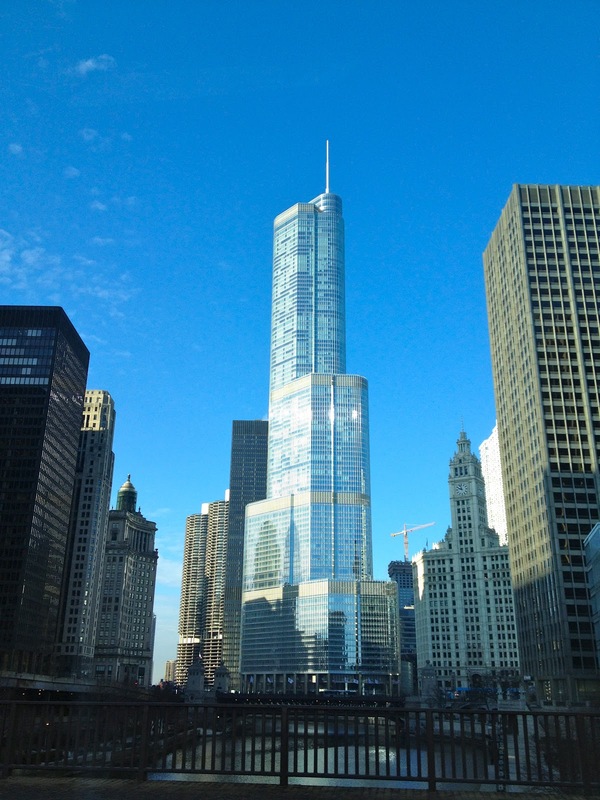 Well, the very first season, Bill Rancic was hired by Donald Trump to oversee the building of Trump International Hotel in Chicago. This is the same hotel where my husband booked a room for our anniversary weekend. Then for dinner we had reservations at RPM, an Italian restaurant partly owned by Bill and Giuliana Rancic…see where I am going here? Next thing you know, I’ll be babysitting baby Duke! Anyway, let me tell you about this hotel. I took this picture of the hotel (right) as we were heading home. Pretty good shot from a moving car, if I so say so myself. Wasn’t the sky the most awesome shade of blue? The building is not only a hotel, but residences. In fact, in 2011 HGTV was giving away one of the residences as part of their Urban Oasis Dream Home thing. 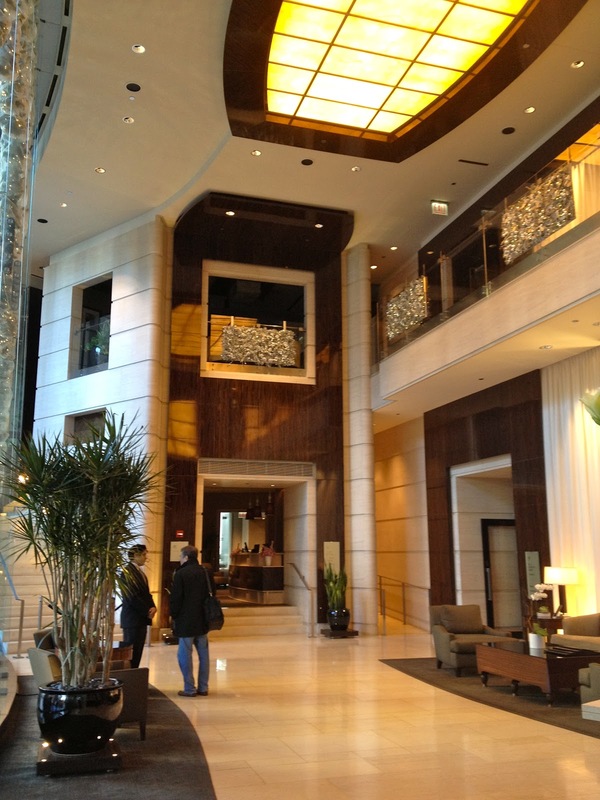 When you arrive, you head left to enter the hotel lobby and right to enter the residence lobby. The staff that greeted us at the front desk were super nice, as was everyone we encountered at the hotel. One of the best hotel staffs I have ever dealt with. My husband had asked for a room with a really good view because he knows how much I love that sort of thing. And boy did they deliver! I loved the view! 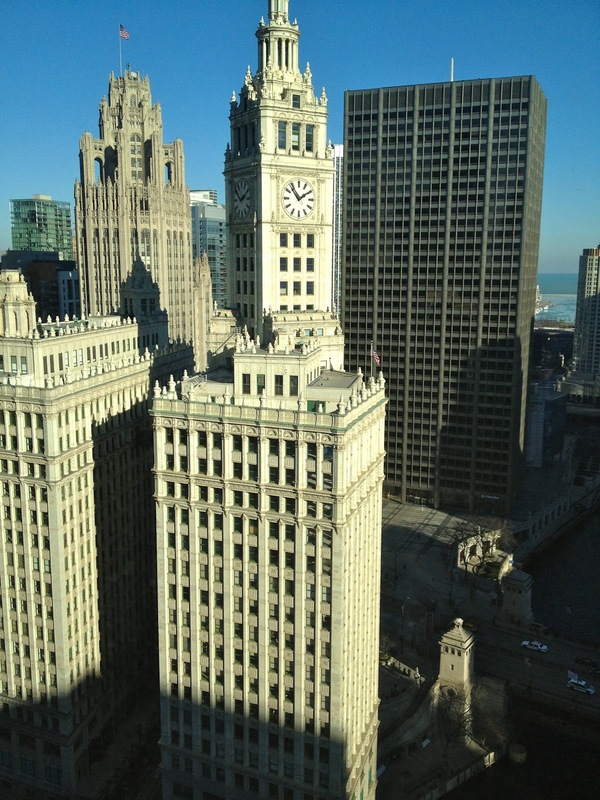 You could see the Chicago River, Lake Michigan and two of my favorite buildings in Chicago: the Wrigley building with a great view of the clock and the Tribune Tower with a great view of its neo-gothic style top. I spent lots of time looking out of the huge picture window. You would to if you had a soft sofa, champagne and chocolate truffles to enjoy while doing it. The room itself was very large. It was a Deluxe Guest room located on the 20th floor. I wish I had taken video of the room to better explain the long hallway you walked into, but the pictures will have to do. Very nice, soft king size bed with Italian Bellino linen and a Bose sound wave system with iPod/Iphone docking station on the bed side table. I took this photo from the sofa in front of the window. You can see the long hallway I was referring to earlier. That leads to the bathroom and the door to the hallway. There is also another closet in that long hallway. This photo shows you how much space you have as well as the full kitchenette that came with the room. 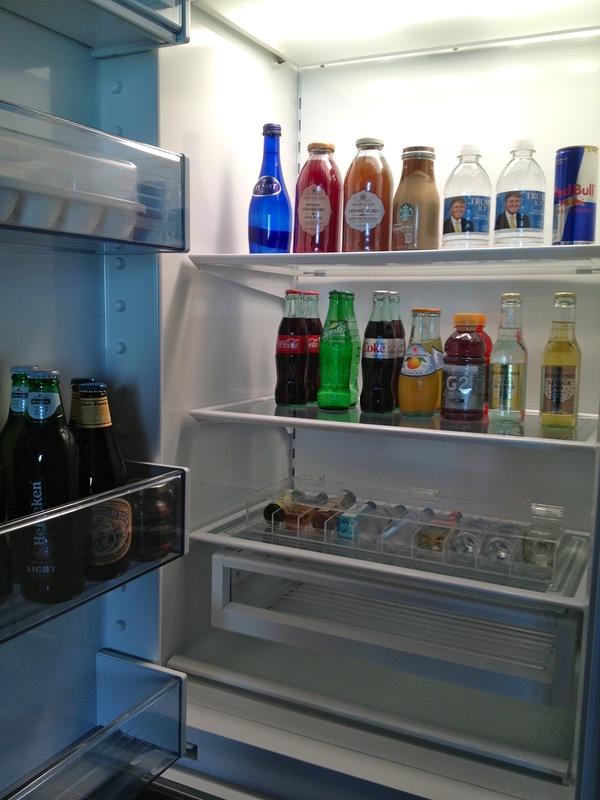 The fridge came stocked with a variety of drinks (all at an extra cost of course), but my favorite thing was the Trump Ice water bottles. I got a little chuckle out of that. The bottom photo is the yummy goodies they had available for purchase as well. Another chuckle with the gold and silver Trump chocolate bars. I didn’t eat or drink any of this since my husband had pre-ordered the champagne and chocolates. 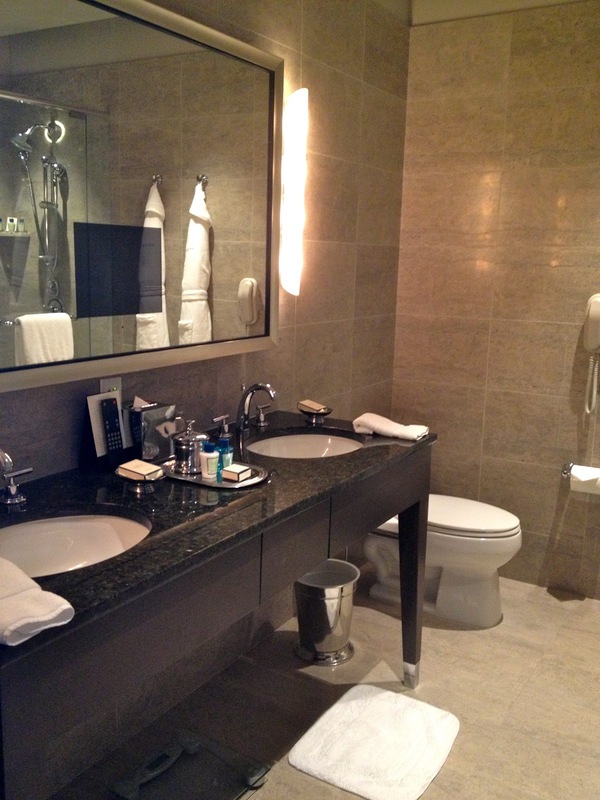 I loved the limestone bathroom with a stone vanity, television in the mirror, deep soaking tub and rainfall shower head. They also had a scale, but I do not want to know how much I weigh when I am on trip. For that matter, I don’t want to know what I weigh EVER! We did make good use of those robes hanging on the wall when we came back from our dinner. 🙂 Not sure why, but I got a kick out of the electric curtains that opened to a huge picture window. Before we headed out to breakfast at the hotel’s restaurant, Sixteen, we enjoyed our in room coffee maker and watched the sunrise over Lake Michigan. So grateful for the beautiful room, my amazing husband and the great weather outside to enhance the experience. Blessed to be celebrating 20 years of marriage! You do have the sweetest husband, Sonja. What a thoughtful anniversary trip! Glad to hear you enjoyed the Trump Tower! I would love to stay there sometime. My husband is from S. Chicago and we love the city! I tried to win that Urban Dream home;) Did you know Vince Vaughn did/does have a residence there? ;) Thanks for sharing and glad you had such a lovely stay! Chicago is a great city. I have been trying to go as often as possible. 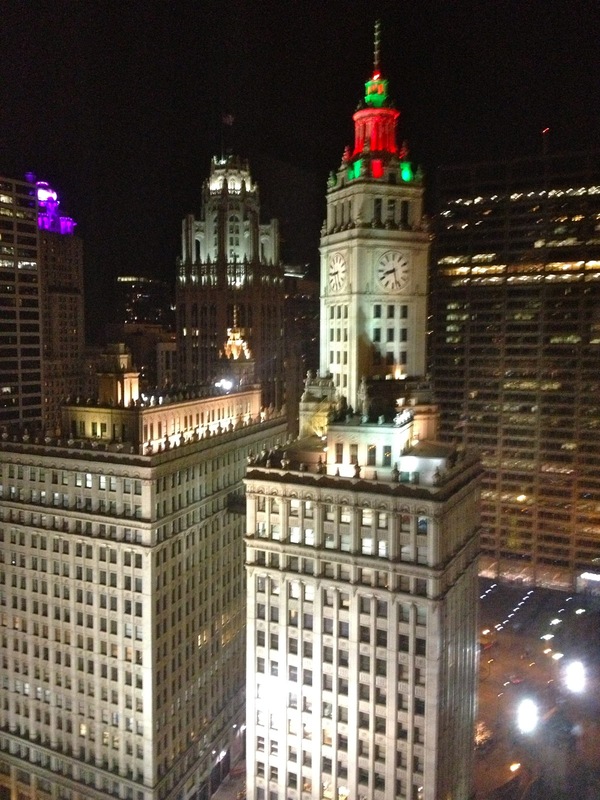 Check out Chicago under Hot Topics for some great places to eat when you do make it there. Wow, we have a lot in common! If you like big cities, you should definitely go to Chicago. Lots of fun things to do there for couples, and families with teenagers. We took the kids to see the Blue Man Group and they loved it! Did you get my message about not being able to link up the Blog Hop picture on my site? I did get your message, Sonja. Somehow I messed up the code for the button and can't get it to work right either. I've had internet issues and then my computer died so I've just not taken the time to fix it yet but I will have it done by next month. I hope you'll link up again! We visited the Orlando area in December and the kids really wanted to see the Blue Man Group but we already had a full schedule. Maybe that's one way I can entice my husband to take us to Chicago. 🙂 While the kids and I love big cities, he's not so keen on the people and the traffic. And more! I'm reading these posts in the wrong order…. I saw your bathroom. Looks great! Perfectly romantic! Great views as well! Loved the view! We had a great time!